Sarvajanik Ganeshotsav — was started by Lokmanya Bal Gangadhar Tilak in 1893.Sarvajanik Ganeshotsav or Ganpati Festival is a public festival in honour of the Hindu deity Ganesh which takes place over ten days in August or early September. The annual domestic festival was revived and turned into a large, public event by Bal Gangadhar Tilak at Pune, India in 1893. The colorful festival is very popular mostly among’st Maharashtrians and is celebrated religiously and enthusiastically by Maharashtrians worldwide.This spectacular festival honors the birth of the beloved Hindu elephant-headed god, Lord Ganesha, popularly worshiped for his ability to remove obstacles and bring good fortune. Late August or early September, depending on the cycle of the moon. It falls on the fourth day after new moon in the Hindu month of Bhadrapada. In 2014, Ganesh Chaturthi is on August 29. It is celebrated for 11 days (ending on September 8), with the biggest spectacle taking place on the last day called Anant Chaturdasi day. 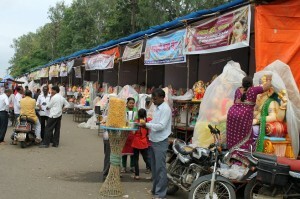 During the festival days, sculpted images of Ganesh are put up in colorfully decorated mandaps (pavilions) which depict religious themes, current events, or other themes relating to social awareness. There are large public displays of images of Ganesh with aarti (light rituals), loud religious music, and dancing by devotees. 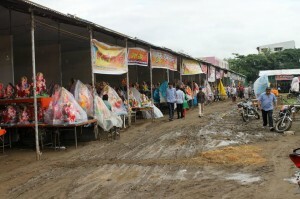 The festival is celebrated in a very public manner. Local communities compete with each other to put up the biggest and best Ganesha statue and display. Ganeshotsav is a festival of Lord Ganesha celebrated during the periods which are usually odd in number. e.g. for 1-1/2 days, 5 days, 7 days, 11 days & 21 days. After the pre-determined period is due the Ganesh idol is immersed in nearby water source e.g. a pound or in sea, in a river etc. The festival begins with the installation of huge elaborately crafted statutes of Ganesha in homes and podiums, which have been especially constructed and beautifully DECORATED. Artisans put months of effort into making the statues. It’s forbidden to look at the moon on this first night as legend had it the moon laughed at Lord Ganesha when he fell from his vehicle, the rat.Once a statue of Lord Ganesh is installed, a ceremony is undertaken to invoke his holy presence into the statue. This ritual is called the Pranapratishhtha Puja, during which a number of mantras are recited. Following this a special worship is performed. Offerings of sweets, flowers, rice, coconut, jaggery and coins are made to the God. The statue is also anointed with red chandan powder. Prayers are offered to Lord Ganesha every day during the festival. 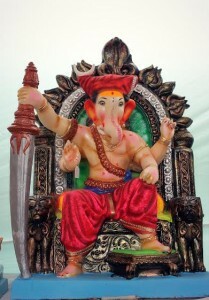 Temples devoted to Lord Ganesha also organize special events and prayers. Those who have a Ganesha statue in their house treat and care for him as a much loved guest. On Ananta Chaturdasi (the last day), the statues are paraded through the streets, accompanied by much singing and dancing, and then immersed in the ocean or other bodies of water. 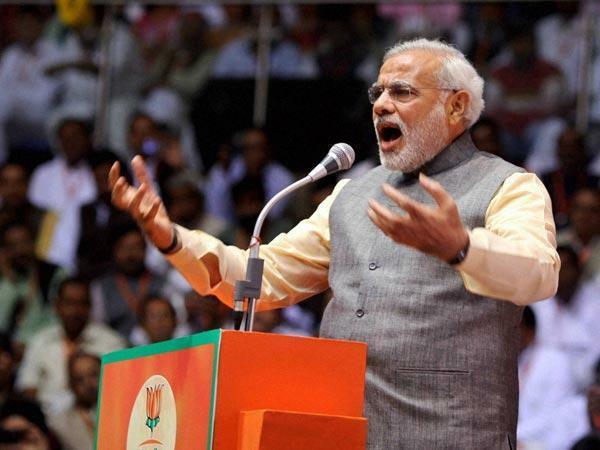 The people then scream in large numbers saying “ Ganpati baap moray pudchya Varshi lavkar yaa”!It basically means that Ganesha says Tathastu to his wish and declares that every time we call out for Lord Ganesh.And next year also you come soon. Processions during Ganeshotsav starting this month, the officials of Nashik Municipal Corporation (NMC) and City Police Commissionerate inspected the procession routes and areas falling on it.They discussed the issues related to road repair works, damaged Electricity cables and excessively grown trees falling on the path here. Meanwhile, the officials’ inspection tour has showed that the administration is gearing up its preparations for the festival now. Along with the Ganesh Mandal activists in various parts of the city, citizens are too seen busy in preparations for arrival of their favourite Ganpati Bappa this year. Officials took stock of encroachments, damaged electricity cables and branches of trees creating obstacles in traffic on the roads in Nashik area. They directed the personnel to ensure all necessary repair works before the festival begins. The inspection tour of officials began from Uttam Nagar and the officials then moved on to Pawan Nagar, Raigarh Chowk, Savta Nagar, Divya Adlabs and from Trimurti Chowk to Ganesh idol immersion place in the area via Dutt Mandir in the area. With all the love and care from all over we hope for a peaceful, pleasant, colourful , decorative, soulful Ganeshotav this year. 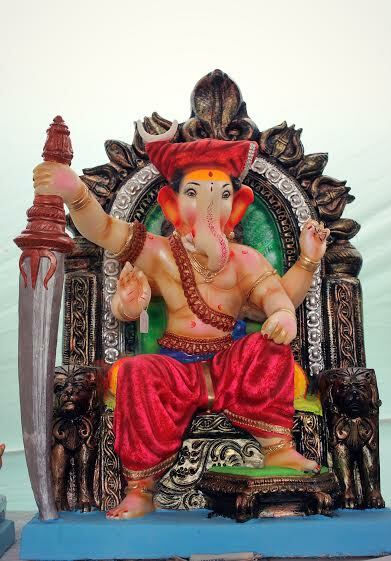 We hope our city Nashik gets blessed by our beloved Ganpatti Bappa and May he shower all his blessings upon us! So let’s all together before starting this Festival say. Tags: Nashik preparation for ganesotsavNashikar's gear up to welcome their beloved Lord Ganesh!! 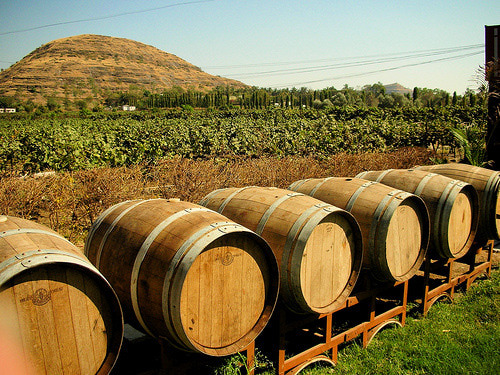 Previous story Luxurious Deccan Odyssey to Pass Through Nashik (With MAP) ! !